First of all, it's Friday woohoo!!! Honestly it's not fun to say it's Friday anymore, at least for me. Cause by the time you look up to thank God for the weekend, it's Monday already! Again, at least for me. I remember a while ago whenever Monday rolled around and I was back at work, some co-workers would ask me how my weekend was and I kid you not, all I could say was "Seriously, I don't even remember". No it wasn't because I went partying and got drunk, coupled with a hangover the whole weekend but because it went by so fast I didn't even have time to take everything that happened in. Anyways... I still thank God for Fridays. So I was thinking maybe it would be a good idea to put up one song every Friday (if I remember and have time lol) to just inspire me for the weekend coming up. I really don't know why but lemme see if it'll make a difference sha. Plus I love music so it shouldn't hurt to share the one song that I'm really "feeling" during the week right? Alrighty then, first one up... titled Worthy To Be Praised by the one and only 'Ronke Adesokan off of her debut album Bigger. I don't know exactly what it is but I am just so in love with this song, well among some others on the CD too. 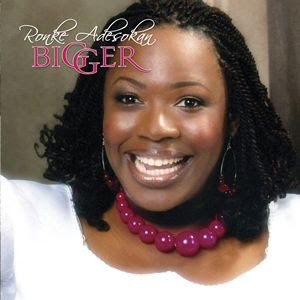 I absolutely, absolutely love Ronke Adesokan! Her amazing voice is one thing but then I dunno, maybe it's her ad-libing that just blows me away. She's incredible I tell you; if you don't have any of her CDs -Be Still and Bigger- mehn, I would like to feel sorry for you lol. Anywhoo click play, sing along with the lyrics provided, and be inspired to praise God more cause He's worthy! Enjoy!!! And of course, please lemme know if you love it as much as I do. Have a great weekend. Is that song a re-cycled version OR an original? Anywhooo, have a nice day! You already know how it goes if you're not blogging about your personal life on here. Anyway can't say that I have time for that sha. The song is actually an original but then she mixed it up with the bridge part which is already an established song. hope you enjoyed it?!?! Been meaning to ask. emm..
Yeah the "Heavenly" feeling, that's what I'm talking about. Most of her worship songs will do that to you. hehehe yes o they're groundnuts; pls don't ask me why cause I have no idea at all. I need to do something about it sharpish! Wud u bliv the babe singing is my cousin oo! I sharply called mumc to giv her hot gist; "Mummy, guess who is now a singer??" See the kind of ela i chopped, she was like " I already know, she even leads the choir at church"
hixxxxxxxx....i thot i was current! oh well, nice nice song! She's good, but I need a song where I can really hear her own voice! Of which, I was takin a good look at ur wishlist, I have the Lara George album, I can email it to you if you want! okayyyyyyy! Long comment! Ciao..pixx hout! hi there ppl. I'm actually into shoes and I was looking allowing for regarding that singular make. The prices as regards the sneakers are about 350 pounds on every site. But for all I set this locate selling them as a remedy for half price. I in reality like these [url=http://www.shoesempire.com]prada sneakers[/url]. I will absolutely purchase those. what can you say about it? this weblog's post to be updated daily. It includes nice material. with HTML. I'm starting a blog soon but have no coding knowledge so I wanted to get guidance from someone with experience. Any help would be enormously appreciated! a few percent to power the message home a little bit, however other than that, this is fantastic blog.